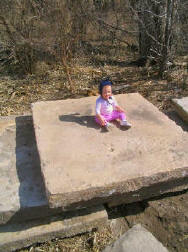 The pavement of Kansas yesteryears was quarried just like the building stones only in large slabs. 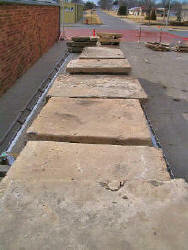 In the past these slabs were laid for sidewalks and last to this day. Imagine pouring a four inch slab and laying four inches of stone on top of that and you will have the rough equivalent of these old stone walkways. This same thing is possible today. Instead of hauling them to the site beneath a special lorie pulled by a team of mules we load and set with a forklift and bobcat. Whether set with mules or set with hydraulics the product is the same. A stone sidewalk that will last 200 years.